Upon arrival Kilimanjaro airport, transfer to Moshi at the base of Mt Kilimanjaro. Transfer to the Kilimanjaro National Park Gate at Marangu. Commence climb. Start the climb through fascinating rain forests till you reach the first hut - MANDARA. 2,700m (9,000 ft), 3-4 hours. After breakfast you set out to Horombo Hut. The altitude gain today is significant and so a gentle pace is ideal to slowly gain altitude. By mid afternoon you reach camp and can relax. You have another night here to adjust to the altitude. Today is a essentially an acclimatization day. To imporove your acclimatization you head out of the day on a hike to higher altitude which takes you towards the Mawenzi volcano. If the weather is fine the views once at the half way point of the saddle between Mawenzi and Kibo. In the afternoon, return to Horombo hut to relax. After breakfast, resume the climb; the landscape becomes rugged and rocky and groundsels and lobelias appear. 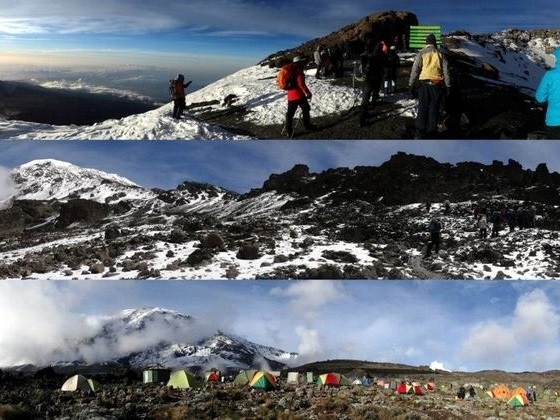 Climb to Kibo Hut. 4,700m (15,520 ft) 5-6 hours. The beginning of the ascent starts at about 3.00am in the morning while the scree is still frozen, then takes about 5 hours to climb the very steep part of the route to GILMAN's POINT (5,680m) which is the most difficult and tiring part of the route. 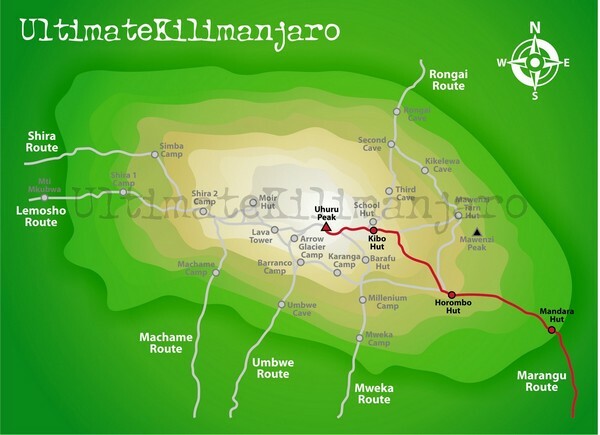 Uhuru peak (5,895m/ 19,344ft) is reached within an hour's walk along Crater's rim. Finally, start the descent to Horombo Hut. Descend to the Kilimanjaro National Park gate, from where you are transferred back to your hotel for dinner and overnight. After breakfast transfer to Kilimanjaro airport. Upon arrival Kilmanjaro airport, transfer to Moshi at the base of Mt Kilimanjaro. Transfer from your hotel to the Kilimanjaro National Park Gate at Machame. 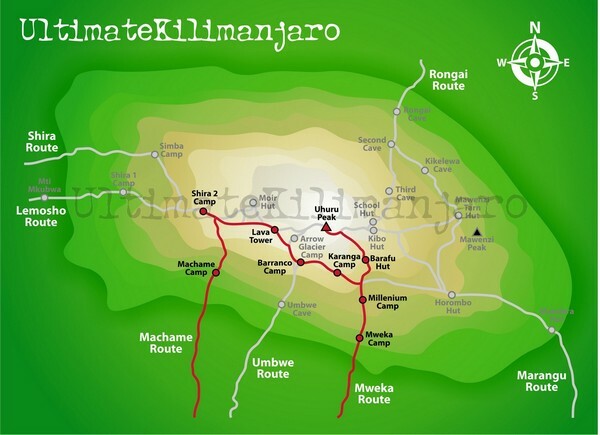 From here you trek through the lush forest to Machame Camp 3,000m (10,000ft). Overnight Machame Camp. Leaving the forest, the path follows a steep ridge, passing through heather and open moorlands, and crossing a large gorge to reach Shira Camp 3,800m (12,500ft). Overnight Shira Camp. Today is another half day ascending to Barafu camp. Desolate alpine desert and at times strong winds rip over this camp and yet in the evening splendid views of Mawenzi peak area the norm. Overnight Barafuu Camp. Descend to the park gate, from where you are transferred back to your hotel. Dinner and overnight in Keys Hotel or Parkview or similar class. 2 nights at base hotel (1 night before and 1 after the climb on half board basis). Accommodaiton & meals during the climb. Climbing fees (Park fees, Hut fees & rescue fees). Mountain guide, porters, cook, waiter, etc. International air ticket, Airport taxes, HK security charge, Airport construction fee. Hyperbaric chamber USD200 with extra porter to carry it.